The purpose of this project is to document the history of the Information Technology Infrastructure of the AAVSO, how it came to be, what hardware was used, who were the people involved, and how the technology was used to further the mission of variable star observing and analysis. Here you'll find copies of notes as they were written as the project evolved. Here you'll find pictures and photographs - some unpublished elsewhere. Here you'll find copies of the posters and papers generated by this research. The project is basically divided into two parts. The first part takes the AAVSO's computer history form 1967 to 1997, what I call the "Pre-Price Years." The second part of the project will document the computer infrastructure history from 1997 to the present day. Each phase of the project will consist of a poster and then a paper published in the JAAVSO. The vast majority of the reasearch for this era came from the Director's Reports of Margaret Mayall and Janet Mattei as documented in the Journal of the American Association of Variable Star Observers. • Here you can find the original notes made during that research. Remember, these are original notes, so there will be mis-spellings and incomplete sentence structure. • Here you can download a PDF copy of the poster. • The poster was created using Free Software tools. Here you can download the original file, as created in Scribus 1.4.0 RC3, in .sla format. These photos are ones that didn't quite make it into the poster. Here we have another view of the card punch machines as they appeared in the Concord St. office back in the late 70s. Sara Beck poses at the Card Storage locker. This gives you a small idea of how many cards the AAVSO had accumlated over the years, and how many observations we had. This was not the entire card set! A view of the Concord Avenue Office in the 1985. Cards were stored lining the walls of Headquarters. Dr. Janet Mattei and Dr. Owen Gingerich from the Center for Astrophysics at the Harvard-Smithsonian Astrophysical Observatory. Dr. Gingerich was a critical early AAVSO computer benefactor enabling the AAVSO to use time on the CfA's CDC 6500, PDP-11/60, and the VAX 11/780 during the late 60s and 70s. 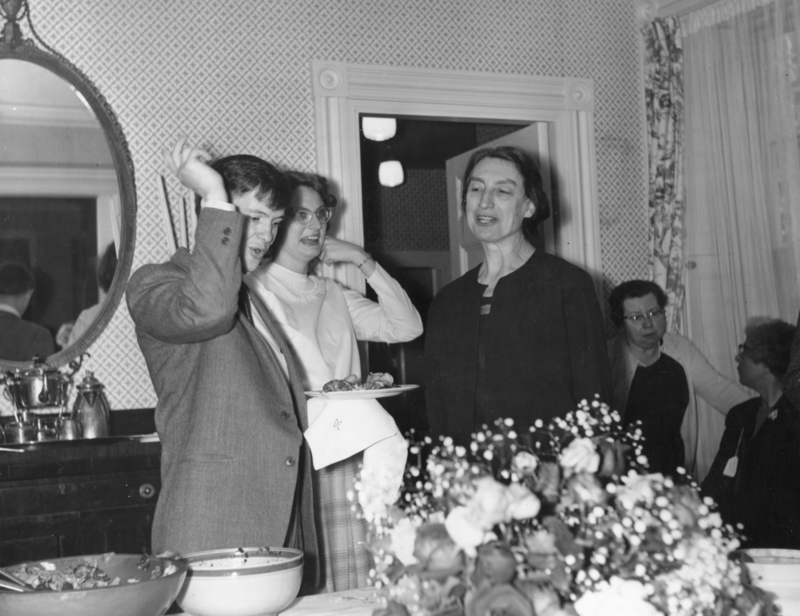 Dr. Owen Gingerich, Barbara Welther, and Dr. Dorrit Hoffliet at a party in the early 70s. 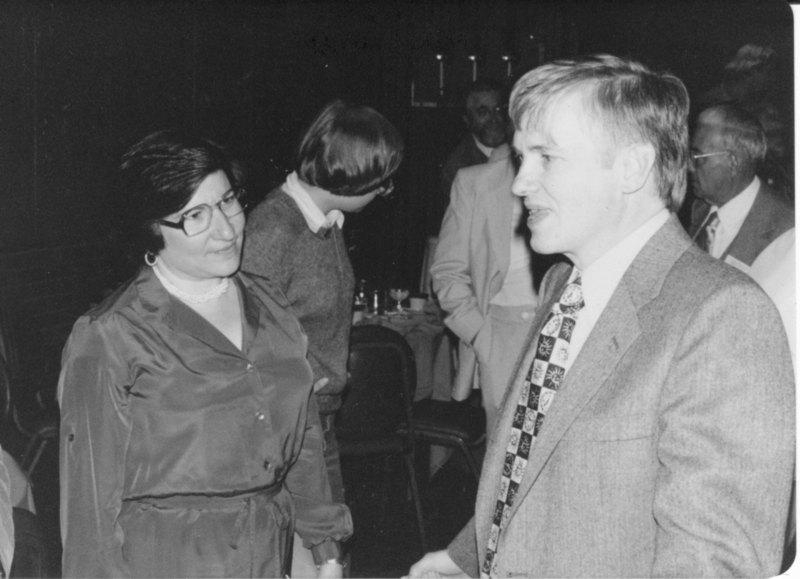 Barbara Welther, working at the CfA with Dr. Gingerich, contributed some of the very first programs to the running of the AAVSO. Due to a couple of deaths in the family, as well as the general business of our Centennial Year, the corresponding Paper for Part I was not worked on as quickly as I wished. The first draft of the Paper is now being written with the first major draft being due by 15 Jan 2012. It will be submitted for the JAAVSO Centenial issue on the due date of 15 Feb 2012. Watch this page for further developments as the project continues!